There we were at the Black Horse (sadly no beer available) inspecting Lenny and Helen Vaughan’s balloons when the subject turned to birds. Now Lenny is a true expert on the lesser-spotted butter-necked siskin and what he doesn’t know ain’t worth a carrot. So it was we started discussing our latest mate at the farm, a Raven, uncommon where we are and probably coming down from London on a cheap day return, then moving onto the Swallows that are full flow at our Mary’s. Minutes later John was enquiring on the various differences between the winged wonders Swifts, Swallows and House Martins. So here we are, another spin off, and thanks to Lenny for the idea and clearing a few points up. We are really lucky as we often see all three at Wellwick Farm, my daughter Mary’s home. 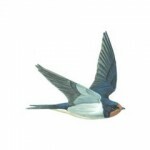 Throughout the British Isles Swifts, Swallows and House Martins are sadly all in decline. There are many reasons for this but suitable nest sites are getting rarer to find mainly as a result of older buildings being renovated or converted to residential homes, old nesting holes being blocked up and the general attitude towards things living on, or in, our houses, like relations! Whereas I agree that the livestock that falls out of a House Martins’ nest above an open window can be quite interesting it can also be very irritating! Nets above windows will stop them nesting there but if their nests are elsewhere please leave them be. When we were kids we were told that identification was easy. Swifts flew the highest, then Swallows and finally House Martins, which operated at ground level. Obviously this soon proved to be useless unless all three were flying together! It then turns out that House Martins actually feed higher than Swallows! Anyway here’s a few pointers that may help. If you want to find out more the RSPB has a great website and every UK bird is listed along with loads of information. For verification I went back to my ‘What to look for in Summer’ Ladybird book and the ever trusty ‘Dumpty Book of Nature’ which, alongside the House Martin listed the Sunbird, native of Ceylon! Now that’s a book to get your attention! Generally they are the last to arrive at the farm and usually return to their old nest around early May having travelled from Africa. They don’t so much arrive as you become aware of their presence, bit like their going, the first of the three, in August. Suddenly they aren’t about anymore. They normally tend to live in local colonies and mate for life so it is really nice when a pair turn up. Quite moving really. Their arrival is announced by their high pitched single note call. Their natural nest sites are crevices in trees, caves and cliffs but these are rare in Britain so they are far more dependant on higher man-made nooks and crannies like roof beams, open eaves or inside old high-roofed buildings or under broken tiles. On the farm they tend to choose the higher beams in the open barns tight into the roof. The nest is a basic affair of dry grass, feathers and straw glued together with saliva and unless you watch the bird’s returning flight you’ll have a job finding it. Its seldom you’ll find them nesting under 15 foot up as they tend to dive out the nest to pick up flying speed! If you can see the nest its probably not a swift’s! Many describe their natural habitat as ‘the air’. That is one cool description and probably about the only bird that rightly deserves the accolade. They are pretty easy to identify from their overall dark colour, sickle shaped wings and very fast, very agile swooping and soaring flight often attaining quite a decent altitude, sometimes in groups, especially when the young have fledged. If they get close enough they have a paler throat. The flight is characterised by the very few beats with the wings appearing to almost remain in a rigid crescent shape as they duck and dive. Their constant search for insects also sees them swooping low and fast between buildings or even over the open fields and water. I read somewhere that a breeding pair will get through 12,000 insects a day. They collect the insects in their beak forming compact balls bound with saliva. In an aphid plague in Oxford, one food ball was found to contain 726 aphids, 48 leafhoppers, 22 spittle bugs, 23 crane flies, 18 dung flies, 13 ladybirds, 120 ants and various other insects. You wouldn’t want that in your eye! 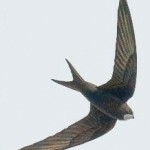 Myth and legends abound about swifts. True enough they do live on the wing, they drink water by skimming the surface or catching raindrops, they can fly at well over 100mph and are even reputed to sleep on the wing, although I’m not sure how that works, and they even collect nesting material on the wing. We watched one whizzing over some swirling feathers caught in a mini dust devil in the yard one day before disappearing off with a beak full. That they don’t ever land is not strictly true. Although landing and trotting about never happens, unless they get it wrong, (Latin name apus apus means ‘without foot’, so both feet are missing?) they do cling vertically to buildings and occasionally in large numbers. They never perch on wires, or anything else but in bad weather they will roost in their nests. If they do happen to have a forced landing it will be almost impossible for them to take-off again. If you can catch it check it for injury then gently but firmly throw it back into the air and all being well it will return to its natural home. Be warned though, swifts are pretty pest-ridden, not being much into personal hygiene, so picking one up will leave you with some weird and wonderful creepy crawlies over your hands and arms almost instantly! I know that for a fact! One of the most amazing discoveries in recent years is their enormous feeding range. They will out-fly weather in large flocks to find food or somehow work out where an abundance of insects is to be found. This can be hundreds of miles from their nest site, even back into mainland Europe, but they will always return to the nest with the catch before setting out again even if means an overnight pass is required! 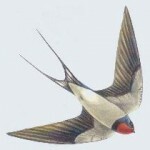 Swallows feature big-time in poetry, literature and songs and even have a walk on line in Pink Floyds’ ‘Set the controls for the heart of the sun’, and they eat wasps. They are therefore one of my top ten birds! These friendly little chaps are the number one resident of the livery yard, well established in the stables and especially the indoor yard. They too arrive from Africa but sometimes as early as late March. They spend the whole day whizzing and zooming about the place, often very low level, twittering away to themselves. Their nests are scruffy saucer-shaped affairs jammed into the rafters or on high ledges and held together with dried mud, something the farm has an abundance of! One decided to nest above the light-switches last year which meant that turning the lights on and off could be pretty unpleasant so this year the area above was netted off, the only restriction placed on them. Mind you the girls do have a bit of a moan from time to time should their horses get spattered overnight! They are often seen on the ground drinking from puddles left from filling buckets or taking a break perched on a wire. They’ve always got something they are about to do. 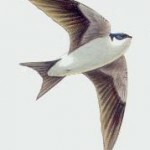 They are similar in length to Swifts but have much shorter wings and fly in a much more aerobatic flowing manner with wings generally angled back. Colourwise they are mainly dark blue above and pale creamy colour below with a darker head which, at close range, has a red chin and blue throat. 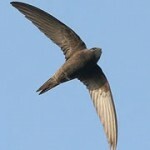 They differ from the Swifts having very long forked tails which when opened show three white spots on the underside. Their call, both in flight and from vantage points, is described as a liquid, trilling, twittering with a song that includes a ‘fast trill’. They tend to feed at much lower levels than the House Martins and Swifts are are experts at low-level strikes and swerving round buildings. Sadly they do get attacked by the resident sparrowhawks from time to time, especially the young ones, freshly fledged, as they shoot at speed out of the buildings. Having said that it is quite rare that they actually get clobbered as most of the early flying lessons take place in the building. When our Mary was very small and awoke early on a summer’s morning I used to sit on the back step with her on me lap and watch the early morning Swallows darting and diving around the lime trees or racing this way and that twittering away. She’d point up attempting to follow then with her finger and make zooming noises. Its great that her daughters share their space with these great little characters and regularily get buzzed by them as they go about their business catching insects. 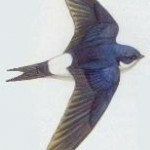 Unlike the Swifts their going is predictable. They start getting into groups, which grow daily, from early September until the wires around the farm are heaving then, as one they go, heading south for Africa and the warmer winter that awaits them there. As often as not there will be one or two stragglers but by mid-October they have all gone. But…they’ll be back! My old man had a cine camera, a wind up Kodak thing. He set his heart of getting some film of the House Martins that had decided to build their nest under the fascia board behind the gutter. We’d watch amazed as they flew at 70mph into the small opening yet never hear a thud or howl! Suffice to say all that came out was some footage of very blurred bullet-like objects nipping in and out of the nest. My brother and I took to hanging out the Crittall window trying to spot them coming in and out. We did eventually realise that if you lent far enough out you would actually get a very brief glimpse of them having a quick peek before ejecting from the nest. Unfortunately this tactic attracted the wrath of my parents as the elderly neighbours said we were giving them heart-attacks especially when we cried ‘Whoa’ every time they came and went! We also ended up with lice in our hair. It thus doesn’t take much to realise the most amazing thing about them are their nests made from almost liquid mud thrown at the building surface and finished off with a small round entrance hole that they can fly through and pull up before impacting the nest contents! In fairness they are quite similar to Swallows at a quick glance but fly with a ‘fluttery’ back flick of their stiffer, more triangular, and broader wings (nicked that phrase!). 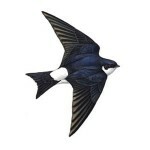 The tail although forked is much smaller than the swallows and doesn’t have the long outer feathers. The colouring is the give-away as they are blackish above and white below from chin to tail with a noticeable white rump. They are most commonly found amongst houses, their nests never built low to the ground and generally feed high up especially in fine weather in large groups. They have a twittering call and a similar twittering song. Interestingly of all the birds that come around balloons House Martins are the most common often circling above them using the rising hot air to gain some precious altitude. Thermal in a bag syndrome. Next time you go flying have a good look above the launch site or the balloon, you may have company. Like swallows they also arrive in April from Africa and form up into large groups on the wires for their flight back in September and October, weather dependant. These are often the last group to leave though and if the weather is mild they can still be seen in late October. Like the swallows they also can be seen perched on good vantage points like wires, roofs and TV aerials and yes, they also attract the attention of the sparrowhawk. According to the RSPB there are between 273-535,000 breeding pairs that visit each year, but numbers are declining. We don’t see anywhere near the numbers we used to, even in the village the nests are few and far between. The big house next to the farm has a couple but I haven’t seen any up there so far this year so maybe they didn’t come back this time round. A lot of houses, even older ones now have plastic fascia boards and I wonder if they can’t get mud to stick to them. The warmer continental weather has meant that many species of bird haven’t got any further north than France and Germany. That’ll be global warming then!